Go to original pattern for design DROPS 190-36. 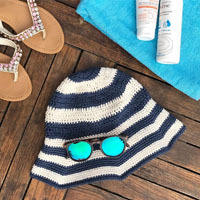 Knitted hat with stripes. Piece is knitted in DROPS Paris. NOTE: Garment worked with one color = 100-100 g Paris. DROPS DOUBLE POINTED NEEDLES AND CIRCULAR NEEDLE (40 cm / 16'') SIZE 3.5 mm/US 4 – or size needed to get 20 stitches and 27 rows in stockinette stitch = width 10 cm / 4'' and 10 cm / 4'' vertically. 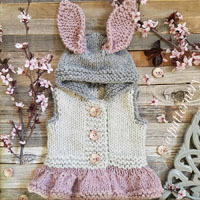 You can get the yarn to make this pattern from	14.40$. Read more. See diagram A.1. Work stripes in stockinette stitch. 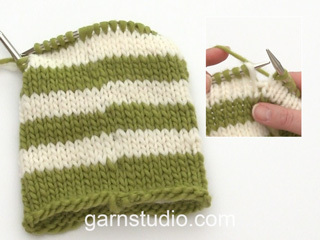 If the stripes are done before correct measurements on hat, continue with light ice blue until finished measurements. Decrease as follows after every marker thread: Slip 1 stitch knitwise, knit 1, pass slipped stitch over stitch worked (= 1 stitch decreased). Worked in the round on a short circular needle, bottom up. 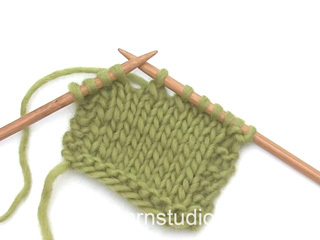 Switch to double pointed needles when needed. Cast somewhat loosely on 130-140 stitches on circular needle size 3.5 mm / US 4 with dark wash. Work in stockinette stitch in the round in STRIPES - see explanation above. REMEMBER THE GAUGE! 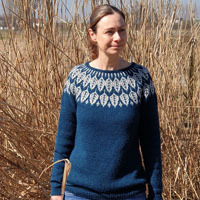 When piece measures 5 cm / 2'', decrease 32-35 stitches evenly (knit every 3rd and 4th stitch together) = 98-105 stitches. 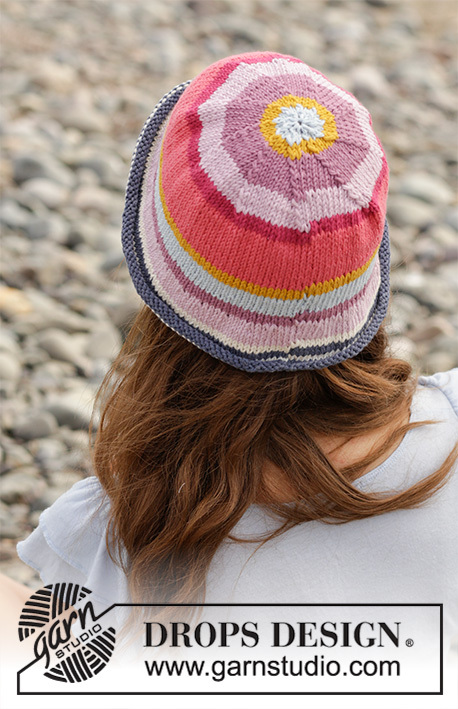 Continue in stockinette stitch and stripes. When piece measures 17-16 cm / 6 5/8"-6 ¼", insert 7 marker threads in piece as follows: * Insert 1 marker thread before next stitch, knit 13-15 stitches *, work from *-* 7 times in total. 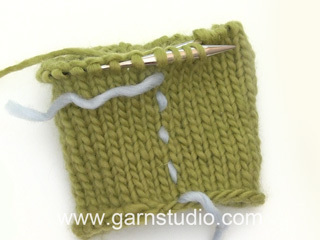 On next round, decrease 1 stitch after every marker thread – read DECREASE TIP (= 7 stitches decreased). Decrease like every other round 10-11 times in total and then every round 2-2 times in total = 14 stitches remain on needles. 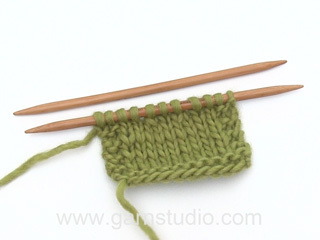 On next round knit all stitches together two by two = 7 stitches remain. 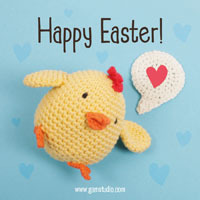 Cut the yarn and pull it through the remaining stitches, tighten together and fasten. 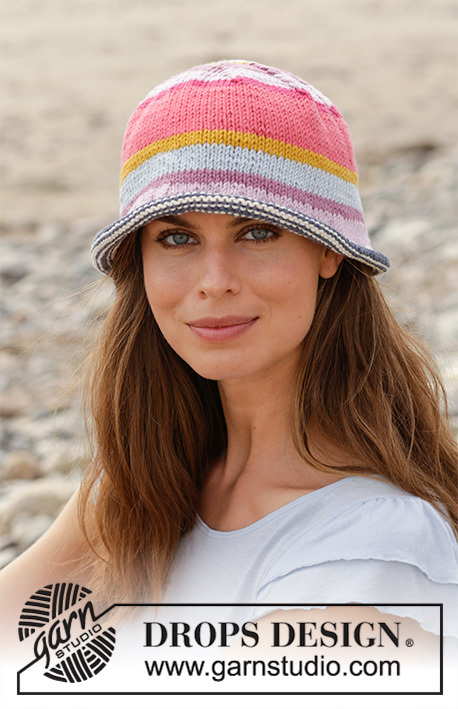 Hat measures approx. 25 cm/9 3/4" from top and down in both sizes. När minskningen ska påbörjas i slutet och det ska sättas markörer så tror jag ni menar "sticka 14-15 rätmaskor" för 13-15 och man väljer 13 så får man sju maskor över. Eller?